Assuming he wasn’t lying, he did actually have an insight, but it just wasn’t very powerful. The mind-earthquake didn’t significantly shake up his inner reality. We’ll call that insight a magnitude of 2.0. In contrast, throughout most of my teen years, I had the habit of eating lots of candy, red meat, deep fried goodies, and fast food. When I was 18, I started working at a Natural Foods Co-op, and after about a year of slowly starting to eat more healthily, I one day went for my typical lunch at McDonalds. Afterward, in a split-second flash, I felt my gut sink and had a powerful insight on just how much suffering there was in eating unhealthily. On a deeper-than-thought level, I knew I didn’t want to live that way anymore. In turn, the desire to eat fast food totally disappeared, and 15 years later, it has yet to come back. As a result, I went from 4 or 5 fast foods meals-per-week to not having even one fast food meal in fifteen years. We’ll call that insight a magnitude of 8.0. 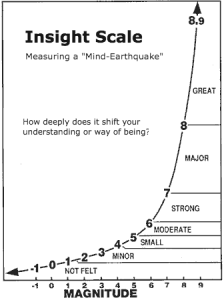 In other words, the measurement of an insight is in how deeply it changes the way we show up in the world. 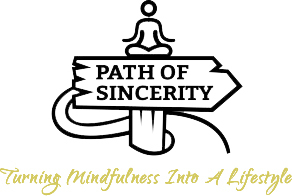 In the next post, I’ll introduce meditative insight and explain why my eating insight that produced such a deep behavioral shift was only an 8.0 insight. Stay tuned!